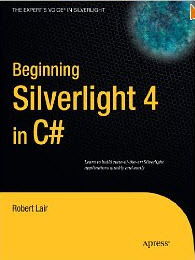 Beginning Silverlight 4 in C#, by Robert Lair, promises that “By the time you finish this book, you’ll have a firm foundation in Silverlight, and you’ll be able to create your own Silverlight-enabled applications.” Well I have finished this book and I feel very confident that I could build a Silverlight app. * XAML is a text-based markup language (not binary). With this version of Silverlight, I felt Microsoft had finally built a development environment for business applications that could run in a browser with minimal frustration. This book starts slowly and assumes you know nothing about Silverlight, which as I said was appropriate for me. It might be helpful to know about coding, but even if this were your first foray into application development, a reasonably smart person could follow the examples. One of the things that’s really helpful is that there are lots and lots of screenshots that show the effect of almost every code change you make. While it starts at the bottom, the author builds nicely, using previous examples when introducing new topics until he arrives at a very nice pacing that he continues throughout the book. He maintains a professional tone throughout that’s very easy to read and follow, and foregoes opportunities to make cheap puns and jokes. (Read it and you’ll see where I mean). This book does a solid job of teaching the fundamentals of Silverlight. Looking at the table of contents in “Pro Silverlight in C#”, also by Apress, I see there’s still a lot more to learn, but you could start building business applications in Silverlight if you read this book, as promised.